Perfectly placed adjacent to the Grand Canyon Railway Hotel and within walking distance of the Route 66 historic district, the only all-paved RV park in the Williams area offers three levels of options, from pull-throughs to buddy spaces to back-ins. Some of the happiest travelers are the ones who never leave home. Why? Because they take their home with them in the form of an RV, motorhome, motor coach, or fifth wheel. Each year hundreds of thousands of these dedicated RV travelers will map out their personalized Great American Road Trip, and each year hundreds of thousands of them will push a pin into one of the world’s great destinations, Grand Canyon. As they wrap up their driving day, they will find a great place to spend the night in the Grand Canyon Railway RV Park. But it’s not just the RV park’s many amenities that attract travelers. It’s location, location … and history. 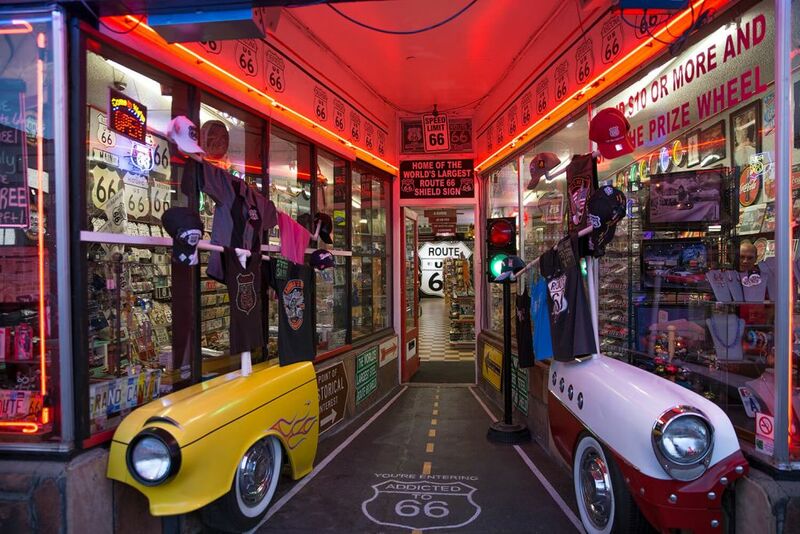 Route 66 once stretched uninterrupted from Chicago to Los Angeles. Over time, however, it lost ground to the nation’s ambitious interstate system until, on Oct. 13, 1984, I-40 bypassed the final, stubborn section of Route 66 in Williams, Ariz. Having outlasted every other mile of America’s Mother Road, Williams retained a retro-hip 1950s vibe highlighted by kitsch signage, neon lights, and cool diners — an absolute trifecta for road trippers. Perfectly placed adjacent to the Grand Canyon Railway Hotel and within walking distance of the Route 66 historic district, the only all-paved RV park in the Williams area offers three levels of options, from pull-throughs to buddy spaces to back-ins. Each is equipped with 50-amp utility services and each is large enough to accommodate larger RVs. And while the Tin Can Tourists who once traveled Route 66 would have been astounded to receive a Western Union telegram at their campsite, today’s guests can stay as connected (or as disconnected) as they wish, with free Wi-Fi as well as high definition digital TV provided by DirecTV. Other amenities include coin-operated laundry machines, updated shower facilities, a community picnic area with gas grills and a fire pit, and access to the hotel’s indoor swimming pool and hot tub. Guests of the RV Park and Railway Hotel enjoy an extra perk for their traveling pets, namely the animal equivalent of a luxury vacation. The Grand Canyon Railway’s Pet Resort is one of the area’s most comfortable, modern, and secure facilities where cats and dogs, both small and large, enjoy abundant indoor space for lazing about. This is especially useful since they must be leashed at all times at the Grand Canyon South Rim and are not permitted on trails below the rim, on park busses, or in park lodging (service animals are exempt). But from their base in 28 clean, cool kennels at the pet resort, dogs will enjoy individual playtime in the outdoor exercise yard and dog run. Kitties, too, can enjoy a dog’s life in 16 sun-filled cat condos overlooking the basketball and volleyball courts. From atop their private sitting ledge, felines savor the setting as they take a catnap. For both people and pets, the location and amenities of the Grand Canyon Railway RV Park is about as good as it gets — a welcome adjunct to the railway itself. The Grand Canyon Railway takes passengers on one of America’s most picturesque train journeys. Departing each morning from the station beside the RV Park, the train chugs north out of Williams for a ride up and over the massive Colorado Plateau. At just over two hours, the journey gives RV travelers the chance to take a 65-mile shortcut and leave the driving to the engineer. It’s a perfect way to arrive at Grand Canyon National Park rested and relaxed without worrying about navigating a trailer or motorhome through the twists, turns, and often dense traffic that concentrates at the park’s south entrance. Beyond the convenience is the sheer pleasure in the journey, with seating choices ranging from standard cars with comfortable seats and wonderful views at the front of the train to the Luxury Dome Car in the middle and Luxury Parlor Cars decorated in Gilded Age glamour at the tail end. With each railway car fully refurbished to its original authenticity, what you’ll experience inside the train is matched only by what’s outside your window: America’s stunning scenery from horizon to horizon. And it’s all made easier by a quiet night, the modern conveniences, and perfect location of Grand Canyon RV Park. 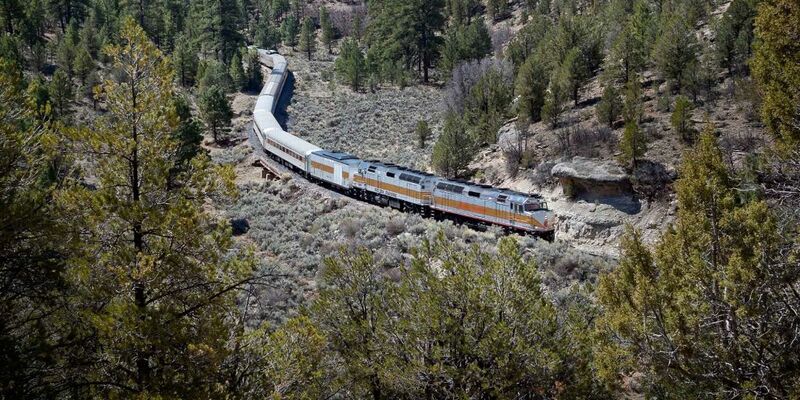 There’s no better way to make a grand trip grander than on the historic train to Grand Canyon. Travel over 120 round-trip miles through beautiful northern Arizona while being entertained by historical cowboy characters and strolling musicians. The Grand Canyon Railway has been departing daily from Williams, Ariz., since 1901. Spend a night in Williams next door to the train depot at the AAA Three Diamond Grand Canyon Railway Hotel. The modern hotel has a grand lobby, indoor pool and hot tub as well as Spenser’s Pub with its handcrafted 19th-century bar. Packages with train travel and overnight stays in Grand Canyon National Park and Williams are available. Visit thetrain.com or call 800-THE-TRAIN (843-8724) for more information.